ZTE has announced the Score, its first smartphone for prepaid carrier Cricket. The Score features Android 2.3 Gingerbread and integration with Cricket’s Muve Music service. A performance machine the Score is not, but based on the $129.99 asking price and no contract commitment required, one can’t complain about that too much. It is powered by a 600MHz processor and includes a 3.5-inch, HVGA (320 x 480 pixel) resolution touchscreen. It has a 3.2 megapixel camera with camcorder, and supports Wi-Fi and Bluetooth connections. ZTE has customized Android 2.3 Gingerbread with its own interface for the Score. 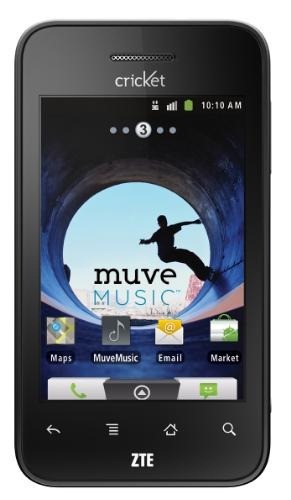 The Muve Music support allows users to enjoy unlimited song downloads, ringtones, and ringback tones on their handset. Cricket will be offering the ZTE Score in Best Buy and Best Buy Mobile locations on September 25 for $129.99. It will be available from Cricket stores and authorized retailers soon after that.